First Appearance: The Human Torch (vol. 1) #2 (Fall 1940): "Introducing Toro, the Flaming Torch Kid"
All Winners Comics #19 (Fall 1946): "The Crime of the Ages"
Avengers/Invaders #1 (July 2008): "Book One: Old Soldiers, New Wars"
Captain America (vol. 1) #76 (May 1954): "The Vulture's Crime Robots"
Captain America (vol. 1) #383 (Mar. 1991): "Man of Straw"
Captain America (vol. 5) #50 (July 2009): "Days Gone By"
Captain America Comics #21 (Dec. 1942): "The Cobra Strikes"
Captain America Comics #32 (Nov. 1943): "Mind Smasher!" The Human Torch (vol. 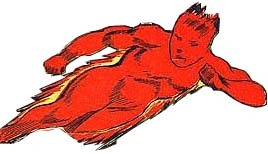 1) #2 (Fall 1940): "Introducing Toro, the Flaming Torch Kid"
The Human Torch (vol. 1) #3 (Winter 1940): "Toro's Parents -- Alive?" The Human Torch (vol. 1) #3 (Winter 1940): "Hot and Wet"
The Human Torch (vol. 1) #3 (Winter 1940): "Namor to the Rescue"
The Human Torch (vol. 1) #3 (Spring 1941): "The Mystery of the Disappearing Criminals"
The Human Torch (vol. 1) #7 (Spring 1942): "The Agent of Death"
The Human Torch (vol. 1) #7 (Spring 1942): "The Case of the Attempted Dreadnaught Disasters"
The Human Torch (vol. 1) #12 (Summer 1943): "Riding a Rocket to Doom"
The Human Torch (vol. 1) #12 (Summer 1943): "Unmask a Gestapo Rabbit!" The Human Torch (vol. 1) #14 (Winter 1943): "Horror of the Mad Dogs"
The Human Torch (vol. 1) #30 (May 1948): "Gay Nineties Gamble"
The Human Torch (vol. 1) #30 (May 1948): "The Hyena Strikes!" The Human Torch (vol. 1) #38 (Aug. 1954): "The World's End"
The Human Torch (vol. 1) #38 (Aug. 1954): "Flame On!" Human Torch Comics 70th Anniversary Special #1 (July 2009): "Introducing Toro, the Flaming Torch Kid"
Invaders Annual #1 (Aug. 1977): "Okay, Axis -- Here We Come!" Marvel Mystery Comics #44 (June 1943): "The Phantom Strikes"
Marvel Mystery Comics #63 (Apr. 1945): "Killers, Incorporated"
Marvel Premiere #30 (June 1976): "Hey, Ma! They're Blitzin' the Bronx!" Marvel Two-in-One Annual #1 (1976): "Their Name is Legion!" What If? (vol. 1) #4 (Aug. 1977): "What if the Invaders Had Stayed Together After World War Two?"